We have a few new arrivals in our wine section! 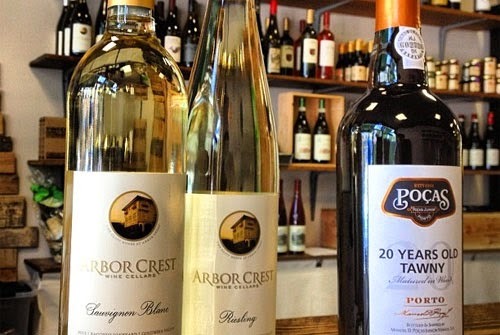 Arbor Cest's Sauvignon Blanc and Riesling left a good impression as soon as we tasted them. The Sauvignon Blanc yields polished flavors of pineapple, citrus, and just a hint of vanilla. The Riesling is well-rounded, showing citrus, honey, mint, peach, and almond flavors. It finishes sweet and supple with slight minerality. And they're both very affordable. The Pocas 20-Year Tawny Porto is exquisite. It has a golden brown color with complex aromas of dried fruit. Flavors of fig and vanilla lead to a delightfully smooth and elegant finish. We also have a nice selection of Oregon, Washington, California, and Italian wines. Come see everything we have to offer!